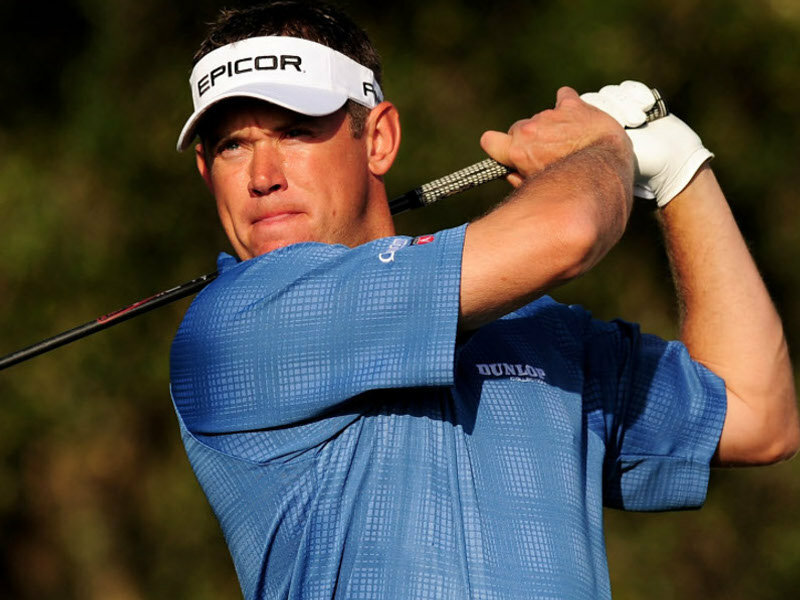 Don’t get me wrong, I have the utmost respect for Lee Westwood. He has a beautiful, fluid golf swing. He got to the top of golf a few years ago, fell to nothing, then climbed out of the career abyss against all odds. Who knows, maybe his best golf is still ahead of him. But for the life of me, I cannot understand how a golfer who has ever won a single major championship – hello, it’s the ultimate measure of champions – can rise to the position of No. 1 in the world, unseating Tiger Woods, who, tawdry scandal or not, has won 14 majors and more money than anybody in the history of the game. This, of course, is not Westwood’s fault. He is not in charge of the rankings and he is suitably humble. But something ain’t right. Is the World Golf Ranking golf’s equivalent of college football’s BCS? I read somewhere that if rankings were done only on this year’s stats, Tiger would not be in the Top 50 in the world. 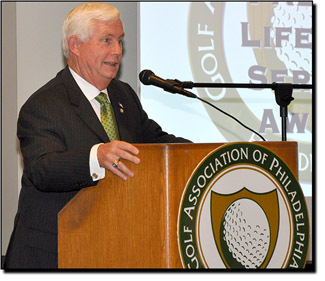 Congratulations to Huntingdon Valley CC head pro Jack Connelly and author James W. Finegan, two of the bright lights and true characters on the local golf scene, both of whom have been honored by the Golf Association of Philadelphia. Finegan, 80, best known for his 1997 tome A Centennial Tribute to Golf in Philadelphia, has been given GAP’s Distinguished Service Award. Connelly, 63, head pro at Huntingdon Valley for 35 years and former president of the PGA of America, was selected as only the seventh recipient of GAP’s highest award, the Arnold Palmer Lifetime Achievement Award. Both men took a bow before a packed room Wednesday night at GAP’s Annual Meeting at Meadowlands CC. I first met Jim Finegan in the fall of 1996, not long after I began covering golf for the Philadelphia Inquirer, when we played in the same golf outing and ended up seated next to each other that night at the dinner. I had heard of Jim, who had retired after a career in advertising, but I didn’t know much about him, other than he had turned his attention to writing about golf and golf history. As I learned that night, Jim is one of the most amazing conversationalists you’ll ever meet. He is full of tales and he enjoys nothing more than regaling an audience of one or a full banquet hall, with story after story, in his inimitable style. It was that same night that Jim told me about a book he had spent the previous five years researching and writing -- the aforementioned history of the first 100 years of golf in Philadelphia. Five years? I get bored working on a story that takes more than a week. I wondered how anybody could spend five years working on a book? When A Centennial Tribute to Golf in Philadelphia was published the next year, it was a 500-page beast that I could barely lift. The more I read and the deeper I dug into the book, the more I became amazed that Finegan was able to produce it in only five years. Ever since then, A Centennial Tribute has remained perhaps the single most invaluable resource I’ve had writing about golf in Philadelphia. It is never far from my reach and only rarely does it fail to include a chapter or a passage telling me exactly what I need to know. On those few occasions when it doesn’t, I pick up the phone and call Jim, whereupon he proceeds to recall in detail precisely what I’m looking for. While Jim regards A Centennial Tribute as his most important book, it is hardly his only one. 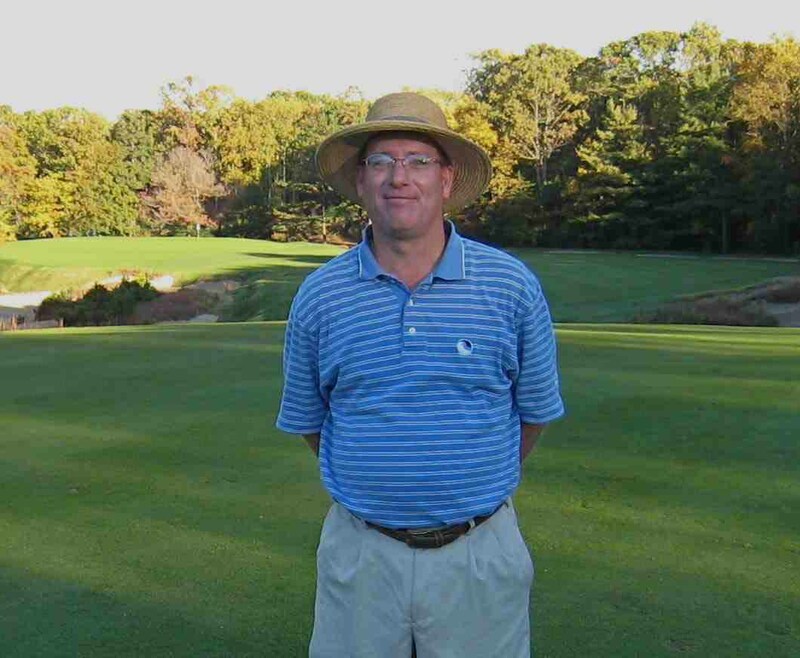 He wrote a history of Pine Valley GC, where he is a longtime member, he wrote separate books on golf in Scotland and Ireland, where he has spent much time. And then there is his most recent effort, a coffee table behemoth called Where Golf is Great: The Finest Courses of Scotland and Ireland. If there is anything more fun than listening to Jim’s stories over lunch, it is playing a round of golf with him. He moves slower these days, thanks to chronic pain in his legs, but when he steps up to the ball it is not hard to appreciate that you are watching a four-time club champion at Philadelphia CC. Jim’s got a quick, whippy swing, and he complains constantly that he can’t hit the ball out of his shadow any more, but he hits it dead straight again and again. On the green, Jim’s "circle of friendship" is as large as his circle of friends in life, which is to say he will rake in a 4- or 5-footer rather than have to bend over to pick it up out of the cup. Jim Finegan is a treasure. As for Jack Connelly, all you need to know is that the man has survived 37 years at one country club – 35 as head pro. For anybody who knows anything about the life of a club pro – they are subject to being fired on a whim -- it speaks volumes about Jack’s work ethic, his smarts, above all, his masterful skills as a politician. What makes Jack’s longevity at Huntingdon Valley all the more impressive is that the man is, at heart, a full-fledged smart-aleck and wisenheimer. In 1975, when Jack had been at Huntingdon Valley two years as an assistant, the club informed him that they were going make a change at the head pro job. Would he be interested in applying? Jack thought about it and said, "No, I don’t think I would." After two years, he told the club, he had either proved himself or he hadn’t. They gave him the job. Not long into his tenure as head pro, Jack looked out on the golf course and spotted a fivesome making its way up the fairway. Among Huntingdon Valley’s most rigid, unbreakable rules, championed by the club’s Golf Chairman, O. Gordon Brewer, was "No Fivesomes,"
Immediately, Jack hopped in a golf cart and went off in pursuit of the offending fivesome. When he pulled up to the group, who should among the fivesome but Golf Chairman O. Gordon Brewer himself. Undeterred, Jack pulled out a pad and pencil, and said to Brewer and the others, "Can you gentlemen give me your names so I can report them to my Golf Chairman." For the rest of that day and the next, Jack sat in his office waiting to be fired. He never was. To this day, Brewer, who was sitting front and center Wednesday night, remains one of his best friends. Over the years, Jack got involved in the politics and administration of golf. He started small, after he was unhappy with the way the Philadelphia PGA Section was running its tournaments and he began to complain. To shut him, the Section put him on the tournament committee. By 1983, Jack was the president of the Section. That led to his interest in national office with the PGA of America, the 28,000-strong association of club pros. Jack climbed through those ranks as well, culminating with a two-year term as president, beginning in 2000. 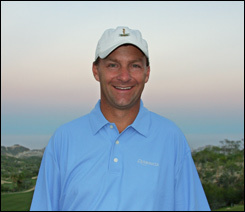 At the end of this year, Jack will retire as head pro at Huntingdon Valley, transitioning into a new role at the club described as "ambassador." "Basically, I’ll be running the outings," he says, laughing, like he’ll be stealing money. Jack can be blunt. If you don’t want an honest answer, don’t ask him the question. But he is also a friendly, funny guy, a fact I had forgotten until Wednesday night, when he gave an acceptance speech that ran the gamut from tears to giggles. Jim Finegan and Jack Connelly are both special people. Congrats to both of them. I got one of those calls yesterday that nobody wants to get – a friend had died. 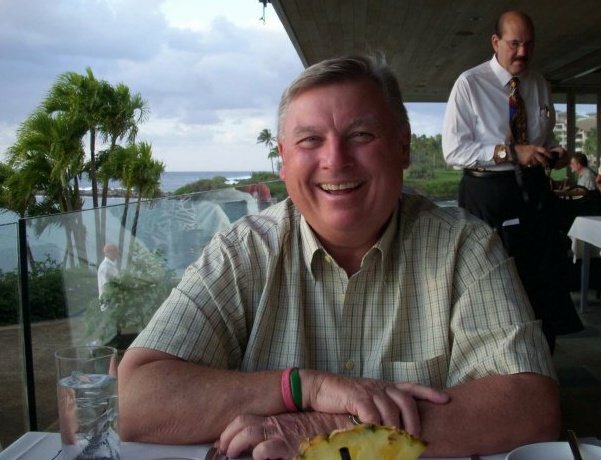 Reid Hanley wasn’t just my friend, he was a friend to about a gazillion people and a friend to golf. A versatile long time sports and golf writer for the Chicago Tribune, he retired a couple of years ago. (Tribune obituary). Reid was not only passionate about the game, he was quite the stick himself, sporting a single-digit handicap. How unfair that Reid, a non-smoker, was taken by lung cancer. I got to know Reid from the tournament circuit. He’d show up at the odd major, or any tournament anywhere near Chicago. Reid wasn’t assigned to cover the Masters, but every year he and a Chicago pal would come down for a couple of days to attend the annual awards banquet for the Golf Writers Association of America and hang around Augusta National for a couple of days. During those trips, he’d dive on a couch in the house I shared with three other writers for the week. I don’t think I ever saw Reid frown. He was one of those guys who was always smiling when he walked into a room. By the time he left, everybody else was smiling, too. Reid Hanley will be missed. I am delighted to report that we are adding a terrific new feature and invaluable resource to MyPhillyGolf – The Bausch Collection. That’s the name I half-jokingly suggested for what is a remarkable collection of photo galleries of golf courses in the region. Haven’t played a course but want to get a sense of what it looks like? Check out The Bausch Collection. The first few galleries have already been uploaded to MyPhillyGolf. To see them, on the home page, go to the upper right-hand corner of the menu bar and click on the drop-down under "Photos." Toward the bottom, you’ll see the list of courses – private and public -- whose galleries are already in place: Aronimink GC, Bella Vista GC, Blue Bell CC, Broad Run GC, Cobbs Creek GC, Inniscrone GC, Island Green GC and The ACE Club. Then click on the galleries themselves, and each individual photo for an expanded version. What you see is only the beginning. In the coming weeks, we will add photo galleries for another 50-60 courses in the region. To my knowledge, it will be the most comprehensive assemblage of Philadelphia-area course photos anywhere. The Bausch Collection is named for Joe Bausch, a Villanova chemistry professor with a passion for golf course architecture. As he plays courses, Joe snaps photos along the way, from every conceivable angle. From the quality of the images, I assumed Joe was working with some sophisticated single lens reflex camera with a top-dollar lens. Not so. He get these results with a small, high-end point-and-shoot camera. MyPhillyGolf came by the photos because I happened to be playing a recent round of golf with Joe at the GC at Glen Mills (gallery coming soon) when he mentioned that the growing collection of galleries was beginning to tax the limits of his 10-year-old Mac and wondered if we’d like to host them. I had to think about it for a full half-second before I said, "You bet we would." The Bausch Collection has been a work in progress for quite some time, as Joe points and shoots his way through the regional golf landscape. If you know of a course that deserves to join the collection, let me know and I will suggest it to Joe. In the meantime, keep an eye out as we add more and more course galleries -- and tell all your golf friends about The Bausch Collection. Congratulations on having your photo collections even more readily available! Great stuff Joe! Joe Bausch is a really great photographer. I’ve spent days at my club taking pictures, but Joe’s beats mine. Plus, he takes the photos while he’s playing! Wow, I just noticed yesterday (9-29)that there was a golf course photo section. 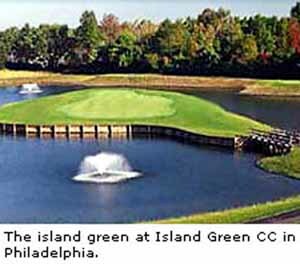 Since I’ve been considering playing Inniscrone and Glen Mills it was great to be able to get a tour of the courses. I had a chance to play Blue Bell CC but saw that each hole had homes on either side of the fairways and i do spray my tee shots sometimes so I passed on the opportunity. Looking at the photos I remember why. Thanks. 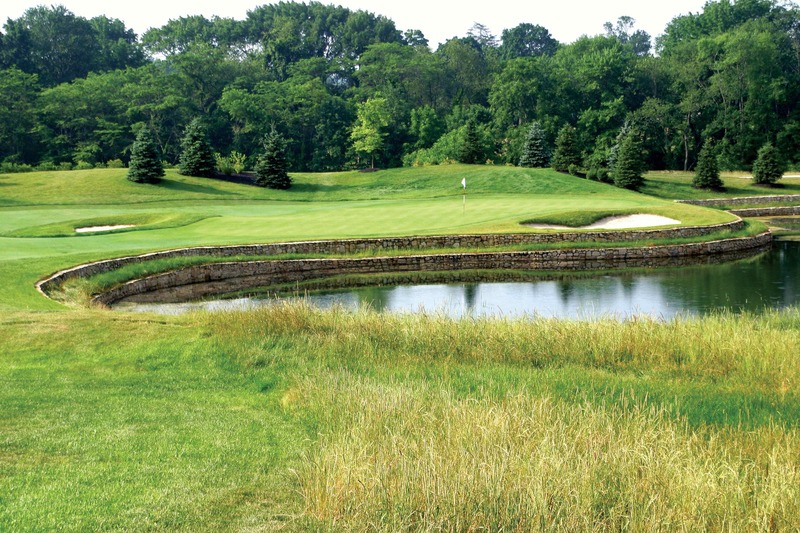 A good feature for the site might be photos of different courses people have played. Joe’s photographic sense and collection are first rate! Great addition, great "Name", too. Wow. I just checked out a couple of the galleries. Great stuff. The further impressive thing about The Bausch Collection is that while he is snapping photos, he is still playing faster than most golfers. Great add.